New Directions, New York, 1955 First Edition, First Printing authentically SIGNED by Tennessee Williams on the page after the endpaper. A beautiful copy. This ORIGINAL dustjacket is vibrant in color with NO chips or tears with minor repair. The book is bound in the publisher's cloth and is in great shape. The binding is tight with NO cocking or leaning with minor to the boards. The pages are clean with NO marks or bookplates in the book. A wonderful copy of this TRUE First Edition without the New York Times blurb on the copyright page and NO credit to Lucinda Ballard or Joseph Mielzinger on page xii. 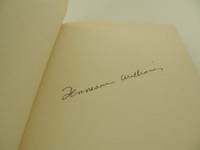 We buy SIGNED Tennessee Williams First Editions.. Signed by Author(s). 1st Edition. Hardcover. Fine/Fine. Penguin Books Ltd. PAPERBACK. 0140481303 New Condition. . New. Penguin Books Ltd. PAPERBACK. 0140481303 Like New Condition. . Fine. New York: New Directions, 1955. Fine/Near Fine. First edition. Fine in near fine dustwrapper with very light wear. Pulitzer Prize-winning play about a dying Southern patriarch and the machinations of his greedy, would-be heirs. The original theatrical performance, directed by Elia Kazan, featured Ben Gazzara, Burl Ives, Barbara Bel Geddes, Pat Hingle, and blues greats Sonny Terry and Brownie McGhee. It was successfully translated into film featuring Ives, Elizabeth Taylor, and Paul Newman. The black, thin paper jacket tends to wear inordinately; this is a lovely copy. New Directions, New York, 1955 First Edition, First Printing with NO credit to Lucinda Ballard or Joseph Mielzinger on page xii. A beautiful copy. This First Issue dustjacket is rich in color with slight wear to the panels. The book is in excellent condition. The binding is tight and the boards are crisp with minor wear to the edges. The pages are clean with NO marks or bookplates in the book. A lovely copy with the original dustjacket.. 1st Edition. Hardcover. Fine/Fine. Very clean, tight book in bright, mildly worn dustjacket. Because the jacket was made for the larger hardcover edition, it is slightly loose fitting. Secker & Warburg London 1956 1st Edition 8vo, wraps. 197 pp. Plain paper wraps in pictorial dustjacket. Advance copy of the first English edition, signed by the author, without inscription, on the front free endpaper.The striking jacket art mimics that of the trade edition. Scarce. New York: A New Directions Book, 1955. First edition. Fine/Near Fine. A Fine copy of the book with a small blue stain on the front paste-down, otherwise in excellent condition. In a Near Fine dust jacket with slight wear at the spine ends (no loss) and a minor chip at the lower edge of the front panel. Corresponding small blue stain on the front flap. Publisher clipped on all four corners, but retaining the original price on the lower front flap. Famously filmed in 1958 by Richard Brooks starring Paul Newman and Elizabeth Taylor. Winner of both the Pulitzer Prize and Drama Critics Award, Tennessee William's "Cat on a Hot Tin Roof" portrays the Pollitt family in Mississippi on the brink of a meltdown. The Pollitt family members attempt to untangle their web of deceits and come to terms with death and an uncertain future. Drama critic for The New York Times wrote that it is "Mr. Williams' finest drama. It faces and speaks the truth.". Fine in Near Fine dust jacket. London: Secker & Warburg, 1956 First Printing of the First British Edition. Signed and inscribed by the publisher, Fredric J. Wailing: 'One of the three finest modern plays / I have ever witnessed. With admiration / from the publisher to dear Eunice / Fredric J. Wailing.' Additionally, with occasional editing by Wailing in light pencil. Winner of the Pulitzer Prize for Drama and the Drama Critics Award for best play of the 1954-55 season; also credited for the acclaimed movie version starring Elizabeth Taylor and Paul Newman. Book in near fine condition; and in very good to near fine dust jacket, with some soiling to back cover, and mild edge wear. New York: New D., 1955. First. hardcover. fine. 197 pages, 8vo, handsomely rebound in full brown crushed morocco. New Directions: (1955). First Edition. First printing of this Pulitzer-Prize play, with no credit on the copyright page to the NY Times, or on p. xii to Jo Mielziner. New Directions First edition (there is no reference on the copyright page to a previous appearance of the preface in the NY Times, and Joseph Mielzinger's and Lucinda Ballard's names do not appear on p. xii. ), 1955. Book fine, except for slight wear at spine ends and corners, slight discoloration on end-papers, slight creasing near bottom of front joint. DJ near fine, except for some rubbing and chipping at spine ends and corners, tiny tear near top of back, small tear (1/3" long) near bottom of back, slight discoloration on spine and back.. 1st Edition. Hardcover. Fine/Near Fine. NY: New Directions, 1955. Book. Illus. by Alvin Lustig. Very Good. Hardcover. Signed by Author(s). 1st Edition. 1955 New Directions First/First of another Williams classic. This copy is in VG+/VG condition. There is a **SIGNED** card with simply "Tennessee" laid in and dated 1980. The HB has very minor wear with just minor bumps at the corners and a bit of browning to the pages. The unclipped DJ has minor wear along the edges, corners and spine ends. **BONUS** Also receive the 1959 New Directions First Edition ( maybe 2nd -no FE statement) copy oif Sweet Bird of Youth in VG/VG condition..
New Directions, 1955 A very good first edition in a very good dust jacket with the original price of $3.00 still on front flap of the jacket. No later printings mentioned on copyright page.. 1st Edition. Hardcover. Very Good/Very Good. New York: Secker & Warburg.. Very Good. 1956. First Edition; First Printing. Hardcover. First British edition. About fine in a very good+ dust jacket. (Couple short edge tears & nicks in jacket. Shelf soiling on rear panel of jacket. Spine lightly age toned. Paris bookshop sticker at base of front pastedown. ) Pulitzer Prize winner and basis for a film adaptation. ; 5 1/4" x 8"; 197 pages . New York: New Directions, 1955. First Edition. Hardcover. Very good/Very good. First edition, first state in a first state dust jacket. An MGM file copy of this gothic American story of brothers vying for their dying father's inheritance amid a whirlwind of sexuality, untethered in the person of Maggie the Cat. Despite the public controversy it stirred up, the play was received both the Pulitzer Prize and the Drama Critics Circle Award. It served as the basis for the 1958 MGM film starring Elizabeth Taylor, Paul Newman, and Burl Ives. This copy is stamped "FILE COPY" and features the bookplate of the MGM Script Department on the front flyleaf, with Metro-Goldwyn-Mayer stamps to the title page and top edge. Dust jacket design by Alvin Lustig. Small octavo. Original light brown cloth binding, with black titles. Minor bump to the top corner of the rear board, with some mild fading along the spine of the boards and the dust jacket, which a trifle edgeworn, largely at the corners and tips. A very good copy. New York: New Directions, 1955. First Edition. Hardcover. Very Good. First edition. (No credit to New York Times on verso on copyright page, no credits to Mielziner & Ballard on xii.) xii, 197 p. Light brown cloth in black lettering. Near Fine in Very Good price-clipped dust jacket. Small stain dot on top edge, slight fading to cloth along bottom edge. Jacket chipped at extremities (especially at head), a bit of foxing to back flap, back panel a bit rubbed and scratched. [New York]: New Directions, . 8vo. xii, 197,  pp. 1 plate of stage design. Tan-coloured cloth, black lettering (very minor shelfwear), w/ d.j. cover art by Alan Lustig (minor rubbing to corners, very minor creasing to couple edges), still a NF/VG copy, w/ none of the usual sunning to the spine, former ownership signature on ffep. First edition, 1st issue of the famed 1954-55 Pulitzer Winner for Drama, and later made into the MGM movie starring Elizabeth Taylor, Paul Newman, Burl Ives, Jack Carson, and Judith Anderson. New Directions, 1955 A very good first edition in a very good minus first issue dust jacket with the original $3.00 present. First issue with no statement on the copyright page noting a prior appearance of the preface in the New York Times and no mention of either Lucinda Ballard or Joseph Mielzinger on page xii.. 1st Edition. Hardcover. Very Good/Very Good. New York: New Directions, 1955. First edition. Cloth, fine, in lightly used dust jacket (design by Alvin Lustig) has a short closed tear on the front panel edge. Crandell A 15.1.a. 05/06/1990. Edition: 1. softcover. fast ohne Mängel, höchstens einmal gelesen. 1502 Computer: Die Ente! DIE GRÖßTE WELTRAUMSERIE! 2009-02-04. New. Ships with Tracking Number! INTERNATIONAL WORLDWIDE Shipping available. Buy with confidence, excellent customer service! New York: New Directions, 1955. FIRST EDITION, first printing with Dust Jacket, Very Good. This is a true first edition with no credit on the copyright page to the New York Times, or on page xii to Jo Mielziner. First edition dust jacket with $3.00 price on dust jacket. Light terra cotta cloth with wear at the bottom with slight fraying to the cloth. The dust jacket is NOT price-clipped but does have several small chips and a gouge on the back panel which does effect the text. Archive tape reinforcement to the extremities. Overall a VERY GOOD book in a GOOD minus dust jacket. Photos available upon request.. First Edition. Full Cloth. Very Good/Good. 12mo - over 6¾" - 7¾" tall. Hardcover. London: Secker & Warburg, 1956. The Pulitzer Prize-winning play for 1955 and made into a notable film with Elizabeth Taylor and Paul Newman. An extremely well preserved copy free of fading to the spine, bright, clean and with the price intact, and free of internal markings or inscriptions, with just a bit of tanning at the edges of the rear jacket panel. Scarce in this fine condition. protected by a Mylar plastic jacket cover.. First Edition. Hard Cover. Fine/Near Fine. Illus. by Photo Frontispiece. Octavo. New York: New Directions Books/James Laughlin, 1955. First State/First Edition. Hardcover. Very Good+ in Very Good- DJ.. Light shelf/edge wear, touch of fraying at head, else tight, bright and unmarred. Dj shows moderate shelf/edge wear, several small chips, light rubbing at foldovers, light creasing near top edge, small closed tear at rear, else bright and clean. Beige cloth boards, black ink lettering. Small 8vo. xiv, 197pp. Ahearn's guides lists two points for the first state, those being the lack of a credit to NY Times on copyright page, and lack of a costuming credit pg. xii, and this copy is correct for both points. Overall, a handsome copy. Condition: Very Good+ in Very Good- DJ. London: Secker & Warburg, 1956. First UK edition. Pulitzer Prize winner for drama and winner of the New York Drama Critics' Award. Small dark stain to tips of several pages, page top edges faintly foxed, name on front endpaper, otherwise very good with covers very bright and fine; in price-clipped, somewhat darkened and soiled dust jacket with small rubbed chips and tears to spine ends (not affecting lettering), still about very good or better. Near fine first edition, first state, in very good dust jacket. Both first edition points are in evidence: No credit to the "New York Times" on the copyright page and no credit on page xii to Jo Mielziner & Lucinda Ballard. Owner's name dated Sept. 1955 and owner's embossed stamp on front free endpaper. Light browning on front and back endpapers, slight edgewear. In very good dust jacket with foxing, water stains, and small rips along top and bottom edges. Signet. MASS MARKET PAPERBACK. 0451137922 Like New Condition. . Fine. London: Secker & Warburg, 1956. 1st Edition 1st Printing. Soft cover. Very Good. Xiv, 197 Pp. Advance Issue, In Plain Brown Paper Wrappers, Of The First Uk Edition, 1956. Light Wear, Slight Roll And Faint Creasing To Spine, No Marks. New York, N.Y., USA: New Directions Books, 1955. 1st Edition . Hardcover. Near Fine/Very Good. 8vo - over 7¾ - 9¾" tall. First Edition, no marks, underlining, or bookplates. No remainder marks. Small bookshop sticker on inside front cover. Former owner's name neatly written on top of ffep. Spine is tight and crisp. Boards are flat and true and the corners are square. "Very Good" dust jacket is not price-clipped with moderate wear, full length crease on front, corner and edge wear and chips. This collectible, " NEAR FINE" condition first edition/second printing copy is protected with a polyester archival dust jacket cover. Still, a nice collectible copy. New Directions, 1975. Paperback. Good. 1975-01-07. New. Ships with Tracking Number! INTERNATIONAL WORLDWIDE Shipping available. Buy with confidence, excellent customer service! Signet, 1958-09-01. First Thus. Mass Market Paperback. Used:Good. 2001-08-09. New. Ships with Tracking Number! INTERNATIONAL WORLDWIDE Shipping available. Buy with confidence, excellent customer service! 2009-09-02. New. Ships with Tracking Number! INTERNATIONAL WORLDWIDE Shipping available. Buy with confidence, excellent customer service! London: Secker and Warburg. 1956. First UK edition, first printing. First UK edition, first printing. Publisher's original blue cloth with silver titles to the spine, in dustwrapper. Black and white sketched frontispiece. An excellent near fine copy, the binding square and firm, the contents with a previous owner's name on the front free endpaper otherwise clean throughout. Complete with the very good rubbed and nicked dustwrapper which has several short closed tears at the extremities. Not price-clipped (12s 6d net to the front flap). Winner of both the Pulitzer Prize and Drama Critics' Award 1955 and the basis for the 1958 film starring Elizabeth Taylor and Paul Newman. Further details and images for any of the items listed are available on request. Lucius Books welcomes direct contact with our customers. (New York): New Directions, 1975. 1/18/2010. Fine/Fine. First revised edition. Fine in fine dustwrapper. A complete revision of the third act for the American Shakespeare Theatre production, and uncommon. 2009-03-08. Good. Ships with Tracking Number! INTERNATIONAL WORLDWIDE Shipping available. May not contain Access Codes or Supplements. May be ex-library. Shipping & Handling by region. Buy with confidence, excellent customer service! London : Secker & Warburg, 1956. First Edition. Very good copy in the original title-blocked cloth. Spine bands and panel edges slightly dulled and dust-toned as with age. Remains particularly well-preserved overall; tight, bright, clean and strong. PROVENANCE: Bookplate of John P.A. Taylor, signature dated 1956. Physical description: xiv, 197p. : 1 ill. ; 21cm. Subject: Family - Mississippi - Inheritance and succession - Fathers and sons - Terminally ill - Southern States - Drama. American drama - texts - 20th Century. Genre: Illustrated. New Directions, 1975. Fine. First revised edition. Fine in fine dustwrapper. A complete revision of the third act for the American Shakespeare Theatre production, . FIRST. New York: New Directions, 1955. xiii., 97pp., b/w plate of stage setting by Jo Mielziner. Some mild bumping to soine, extremities, previous owner's name to ffep., mild age darkening of page edges., unclipped dj. some edgewear, splits, sm. losses, soiling to rear. Third printing stated to bottom of dj. front flap. Acknowledgment to NY Times on copyright page, also credits to Jo mielziner and Lucinda Ballard on page xii. Please ask for extra scans, information. [8406/557] Size: 210mm. x 145mm.. Third Printing.. Tan Boards. Very Good/Very Good. Illus. by Alvin Lustig (DJ). 210mm. x 145mm.. Book.